Save The Swales - Tree Volunteers Needed! Two Rivers Rotary recently donated over 100 Easter bags to the Two Rivers EcumenicalPantry (TREP). 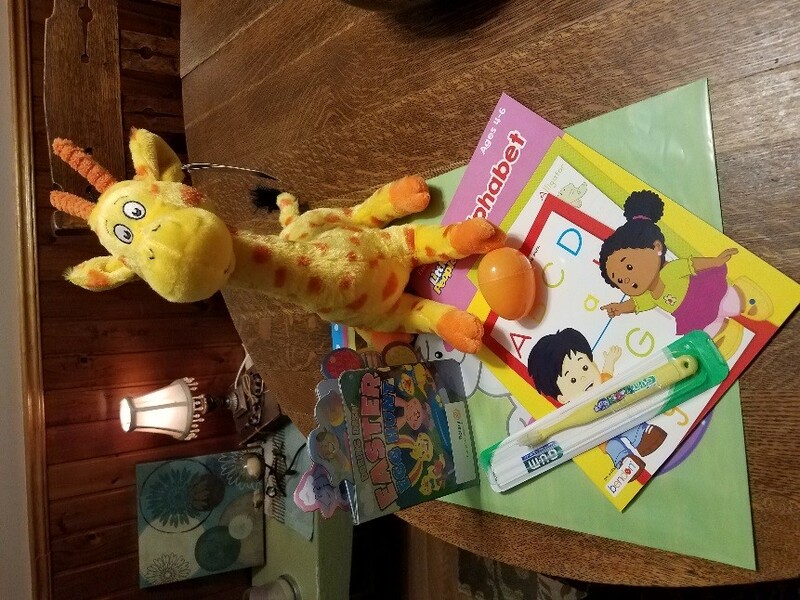 The bags, to be provided to kids ages infant to 12 years, contained an age-appropriate reading book, an activity book, age-appropriate toy, toothbrush and toothpaste. Thanks to all those that helped shop, prepare, deliver and distribute the bags! (Bob G.) Today’s Greeter is Kim H. Bob G. for pictures, Brenda G. for notes from our last meeting and Brian J. for our newsletter. (Bob G.) Correspondence: Thank you (s) – Painting Pathways Member and from Lucy Zeldenrust. (Bob G) Positive Peace: Rotary has partnered with the Institute for Economics and Peace, an independent think tank and leader in the study of peace and conflict, to help address the root causes of conflict and create conditions that foster peace. How does RI (and our Club) promote these principles – Think Global, Act Local! 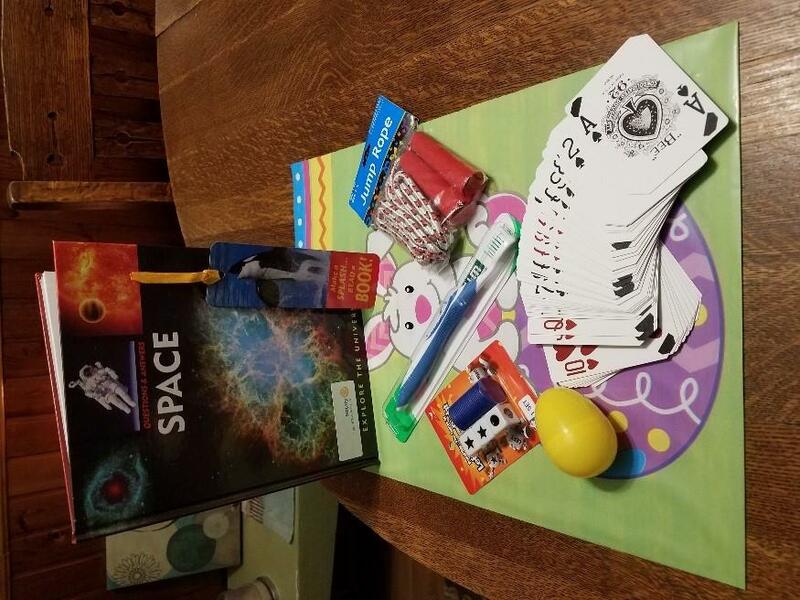 (Bob G.) 2019 Annual Dinner and Auction … impressions and suggestions for next year. Restrict attendees to 63 as this allows a more accommodating fit for the festivities. 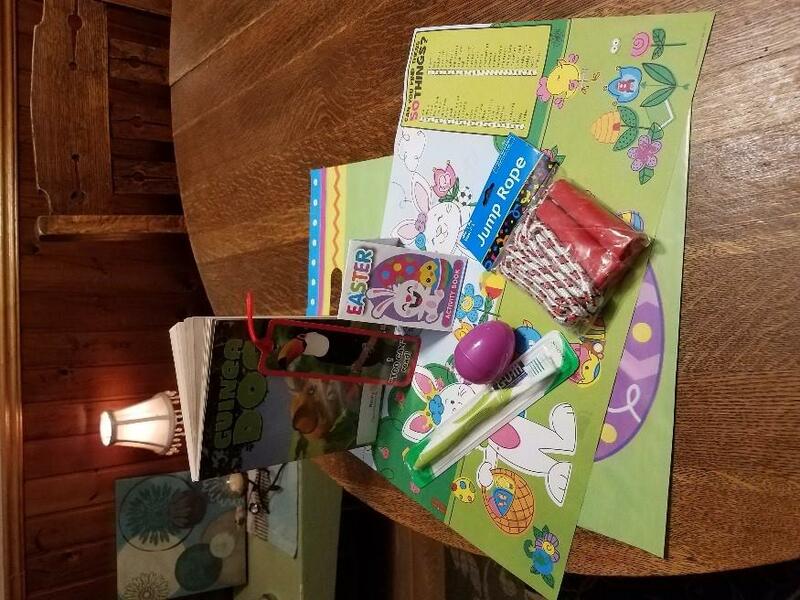 (Brenda G.) Easter Bag project – Update provided by Brenda with bags/food delivered on Saturday (13th) at TREP. Pictures were shared at the meeting with a press release being prepared for inclusion in the HTR. (Bob G.) Event Sign-up – pass the “binder” around – please review during breakfast, noting responsibilities/opportunities, sign up! Please note program assignments and greeter assignments are posted through July 2nd. This information is also available on-line...if questions arise concerning sign-ups…please consult the site as a first source of information. New listings are posted (in binder and on-line) for the Meals on Wheels, Save the Swales, Fifth Tuesday Social, and Greening of the Lakeshore. When an event is created – an announcement and invitation is sent via e-mail to all members. In addition, our club’s website and weekly e-bulletin contain event details and the ability to sign-up. 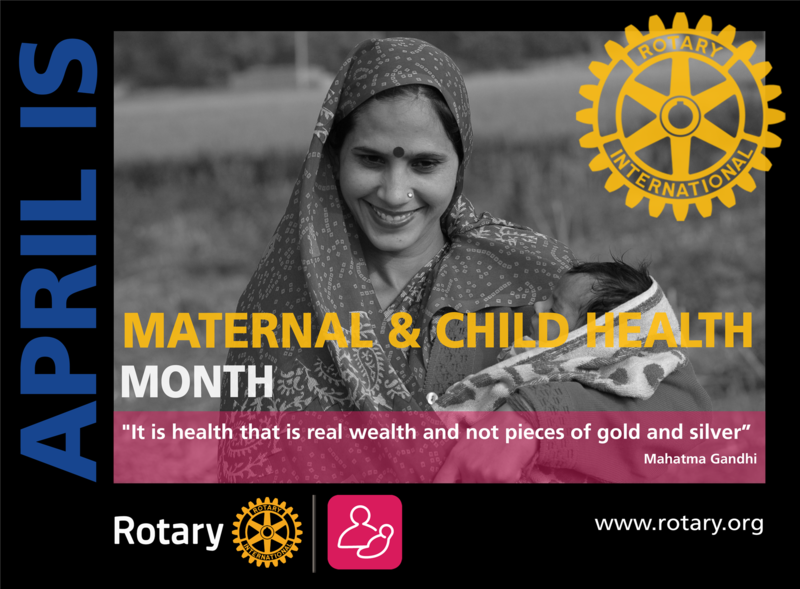 (Jim L.) RI Foundation Minute - The month of April is Rotary International’s month for Maternal and Child Health which is something that is critical to the foundation of any community’s growth or survival. According to the American Public Health Association, “far too many women, infants and children worldwide still have little or no access to essential, quality health services and education, clean air and water, and adequate sanitation and nutrition.” Rotary makes high-quality health care available to vulnerable mothers and children so they can live longer and grow stronger. Improving the well-being of infants, children and mothers should be an important public health goal for every country because their well-being impacts and determines the health of the next generation but unfortunately, that is not always the case in different parts of the world. As Rotarians, let’s continue to locally or globally support projects that positively impact the well-being of mothers, children and infants with our selfless services, and contributions. Your contribution to TRF enables this to happen…Thank You! (Bob G.) Meals on Wheels: May 14-17 is next up. Friday is open for opportunities. (Bob G.) Scholarship – Stanley P. is coordinating the scholarship process with help from Brenda G. The deadline is 4/18. Updates provided by Stanley with “Katie the Kounselor” identifying 2-3 applicants for the one $1000 scholarship. Our selection committee (Brenda, Betty, and Stanley) will meet on May 7th to pick the winner. Stanley will present the award on May 22nd at the TRHS ceremony. (Bob G.) 2019 District Grant – History, Process and Ideas?. Deadline is June 1st with an April 6th training seminar to prepare the required two members of interested clubs – Feedback from Betty and Bob was provided. First, we must complete and report out the current grant award ($1500) by 5/15.The second beach cleanup is scheduled for 4/23 with 5 members from our Club signed up to help the students.Participants will meet at the Spirit of the Rivers area at 9:30am and move towards the South pier…City employees will be on hand to assist in the collection.The last task is to receive, assemble and place the recycling containers with the City storing these until they can be placed at the beach. Ideas for the 2019-20 District Grant are being solicited for consideration and a final decision at the May Board meeting.Our Club has a strong history of receiving the up to $3000 awards with past projects including: CASA; Substance Abuse education/treatment; Literacy; Habitat for Humanity; CP Center garden project; and Healthy Teeth-Healthy Communities. (Bob G.) World Affairs Seminar – participant recruitment (2 positions) – interested participants have been identified for this “life-changing” week long experience. This year’s theme explores the Perils and Promise of Social Media. (Bob G.) 5th Tuesday Social – April 30th. City Central (the best small town bar in Wisconsin)…snacks will be provided with additional food/drink ordered individually. A great opportunity for food and fellowship (and drink). This is a great opportunity to invite friends – fellow and future Rotarians. We will gather at 5:30 and stay until they kick us out. Please sign up on-line such that an estimate of needed food can be provided. Since this will replace our normal Tuesday meeting, the Lighthouse Inn will need to be notified. (Bob G.) 2019 Senior Volunteer Recognition Luncheon (April 8th)… Colleen I. and Stanley P. coordinated the process. Updates were provided from this well-attended event (over 170). Supported by our Club, costs were covered by advertising/Club sponsorship. The relative merit of printed versus power point display was discussed. (Bob G.) Reminder: collection box for recycling items for The Haven. CLEAN plastic recyclable items are being collected. In addition to our Club’s collection site, members can drop their personal collection at The Haven during normal business hours. (Bob G.) Happy Bucks – Tim S. facilitated and passed the buck to Jeff Z. There will be a New Rotarian “Fireside” Orientation at Terragahlia on Thursday, April 25th. Interested Club members are also invited…just RSVP. Brenda G. will compile key Rotary documents for distribution at this orientation. Planning for the Food/Beverage service at the July19-21 Volleyball Tournament is starting with the first meeting to be held on May 1st at the Manitowoc Yacht Club. Michael D. and Jean A. have agreed to co-chair this event with strong Club support also offered! With years of experience under our belts and a well-developed process in place, this role is one of coordinating the volunteers (and arranging for good weather). (Bob G.) Last verse of America. Two Rivers Rotary supports Painting Pathways Clubhouse Renovation Project in a big way! 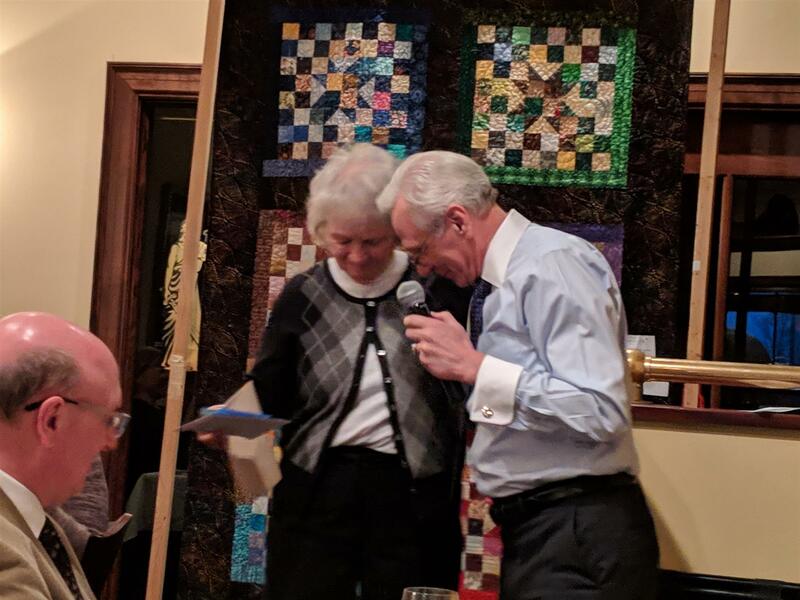 The Painting Pathways Clubhouse Renovation project was the beneficiary of its annual fundraising dinner and auction held on the evening of Sunday, April 7th, at the Courthouse Pub. Proceeds also benefited the Two Rivers Rotary Foundation. With great food, an array of amazing auction items, and Dr. Bob Gahl as the lakeshore’s most entertaining auctioneer, this annual Rotary event lived up to its billing. Thanks to all that attended and supported this event! Preliminary totals include over $14,500 raised in support of this year's project! 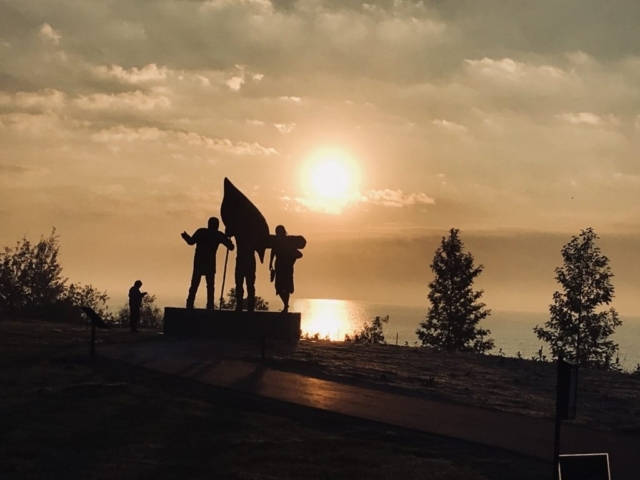 Two Rivers Rotary has generously supported many community projects and organizations throughout the years, including the Rotary Overlook on Mariner Trail, Rotary Pavilion at Neshotah Beach, Kayak Water Trail and donations to TREP, and other great local groups. Lucy Zeldenrust was recognized with honorary Paul Harris Fellow membership for her long-standing support of this event and our broader community. Volunteers are needed to work with TR 6th Grade Students in a clean sweep of the beach. We NEED Rotarian participation to fulfill the 2018-19 District Grant requirements! Meet students at the parking lot by the Spirit of the Rivers statue and clean the beach and path area towards Two Rivers. It's a Fifth Tuesday (April 30th)! After a busy April, the opportunity to wind down is welcome! "This place is a GEM. The retro vibe, awesome jukebox, cold beer, and lip smacking food makes you want to come back again and again"
During the 2018-19 Rotary year, RI President Barry Rassin wants us to Be the Inspiration for positive change, inspiring our clubs, our communities, and our organization to face today’s challenges with courage, optimism, and creativity. To achieve all that Rotary can, Rassin encourages Rotarians to think differently about their role in Rotary and Rotary’s role in the world. He asks us to put more emphasis on our public image and, in doing so, build our membership and attract partners so we can “scale up our service.” And he wants us to focus on larger projects that have a lasting impact on communities. Beauty Brigade Recycling Info - The Haven now collects used personal care packaging to send in for reimbursement. Please help collect and ask others to collect as well. A collection box will be available at each Rotary Meeting. 1. Hair care packaging such as shampoo bottles and caps, conditioner bottles and caps, hair gel tubes and caps, hair spray bottles and triggers, and hair paste plastic jars and caps. 2. Skin care packaging such as lip balm tubes, face soap dispensers and tubes, face lotion bottles, tubes, and plastic jars, body wash containers, soap tubes and dispensers, body lotion dispensers and bottles, shaving foam tubes (no cans), and hand lotion bottles and tubes. 3. Cosmetics packaging such as lipstick cases, lip gloss tubes, mascara tubes, eye shadow cases, bronzer cases, foundation packaging and bottles, powder cases, eyeliner cases, eyeliner pencils, eye shadow tubes, concealer tubes, concealer sticks, and lip liner pencils. Make your own collection box and collect items at any business, school, church, or high traffic location. Drop off at The Haven. Our health is everything, yet 400 million people in the world can’t afford or don’t have access to basic health care. Health care is everyone’s right. Disease results in misery, pain, and poverty for millions of people worldwide. That’s why treating and preventing disease is so important to Rotarians. We lead efforts both large and small by setting up temporary clinics, blood donation centers, and training facilities in underserved communities that struggle with outbreaks and health care access. We design and build infrastructure that allows doctors, patients and governments to work together. Our members combat diseases like malaria, HIV/AIDS, Alzheimer’s, multiple sclerosis, diabetes and of course polio. Prevention is important, which is why we also focus on health education and bringing people routine hearing, vision, and dental care. Rotary members have hundreds of health projects underway around the world at any given time. In Ghana we work with partners to provide more than 80% of its people with clean water to fight worm disease. In Liberia, Rotary helps women get tested for HIV early in their pregnancies. And of course the eradication of polio has created a system for tackling a myriad of other health issues such as Ebola. To date $65 million in grants to fight disease has been given by Rotary. How do you communicate with your community about your club? Are prospective members hearing about who you are and what you do? If your club is looking to promote its unique culture, events, and service projects, you can customize a club brochure. Edit the content or upload your own photos to make a distinctive promotional pamphlet. Use the Discover Rotary presentation and the Impact Begins With You prospective member brochure to introduce Rotary’s values and history, the benefits of membership, and what makes Rotary stand out. Does your club sponsor an Interact or Rotaract club? You can customize your own promotional cards for Rotary’s programs for young leaders through our Brand Center. This is a great opportunity to show potential members all the ways they can get involved through Rotary. What is Rotary all about? What do Rotarians do? Why should prospective members join your club? If you are looking for a presentation on the who, what, and why of Rotary, download the Discover Rotary PowerPoint presentation. This new resource touches on Rotary’s values and history, and highlights the benefits of membership. The slides can be customized to include information and images that reflect your club. This presentation, along with the Impact Begins with You brochure, is an excellent way to introduce Rotary to prospective members or at public events. Visit, Like and Share our TR Rotary Facebook Page! The Rotary Foundation turns 100 in 2016-17! Our Foundation stands at the forefront of humanitarian service, having supported thousands of projects to provide clean water, fight disease, promote peace, and provide basic education — as well as the historic project dedicated to eradicating polio worldwide. Purchase centennial commemorative book, "Doing Good in the World"